Despite careful planning, design and change management the move to a new SharePoint-based document and email management solution at Mountain States Employers Council was very nearly a disaster. Within weeks of implementation MSEC users complained that the out-of-the-box interface to SharePoint in Microsoft Office was making it much more difficult for them to perform routine document and email handling tasks. Many users reported that the new SharePoint-based filing system quadrupled the time it took to do their jobs. MSEC deployed MacroView DMF and found that user productivity was restored almost immediately, and in some cases even improved compared to the previous file share and Outlook folder environment. A further benefit of MacroView DMF was a marked improvement in the capture of important metadata. with professional and cost effective human resource and employment law services. MSEC has over 175 staff and is headquartered in Denver, Colorado. management, SharePoint supports the MSEC Intranet and facilitates collaboration. MSEC uses Office 2010 to fully leverage the Microsoft stack. emails were stored in Outlook folders. would enable more flexible classification and retrieval of emails and documents. current user as the default selection in Person / Group columns. and it was cost effective. The new SharePoint DM solution went into production in July 2011. Within 2 weeks of implementation, negative feedback from users was so great that it became painfully apparent that MSEC would need to back out of the solution if IT could not immediately address these user concerns. MSEC users complained that it was much more difficult to visualize and navigate the new SharePoint document store, compared to the previous file share / Outlook folder environment. The users also found it inconvenient and counter-intuitive to jump between Office applications and the web browser to save documents or attach multiple files to an email. The MSEC IT Department realized that they had underestimated the ‘human factors’ associated with using the out-of-the-box user interface that Microsoft SharePoint provides for managing documents and emails. Those business users were unable to work with that out-of-the-box interface to manage their documents across the large number of libraries within the new environment. MSEC searched the market for a SharePoint add-on that would address this critical ‘human factors’ issue. They selected MacroView Document Management Framework (DMF), the only product that met all of their requirements. Within 30 days of the initial implementation they deployed MacroView DMF and user reaction improved almost immediately. MSEC users liked the way MacroView DMF provided them with an accurate and intuitive tree-view display of the structure of the SharePoint document store. That tree-view made SharePoint feel familiar based on their previous use of file shares and Outlook folders. One of the major frustrations reported by MSEC users as they attempted to use the OOB SharePoint interface was they needed to jump out to the web browser when they wanted to interact with SharePoint. 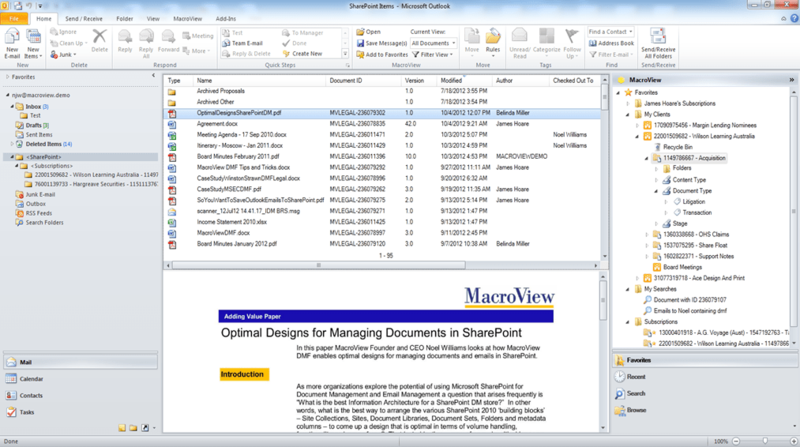 MacroView DMF allowed MSEC users to browse, search, save to and generally interact with the SharePoint document store while they continued to work in Outlook, Word, Excel, PowerPoint or Adobe Reader. 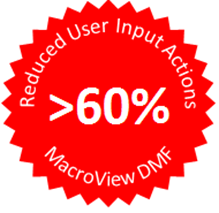 MacroView DMF reduced required user input actions, in some cases quite dramatically. As an example, the user input actions required to search for a document in SharePoint and insert that document as an attachment to an outgoing email reduced by at least 64%, compared to the OOB SharePoint web browser UI. A key success factor for MacroView DMF was the way it significantly improved the user experience around the capture of metadata. This led to a marked improvement in the overall quality of metadata, while at the same time dramatically reducing the effort required of users as they saved documents and emails to SharePoint. The out-of-the-box SharePoint interface did not prompt for metadata as user uploaded multiple documents. Staff were forgetting to go back into SharePoint and update the documents to record that metadata. As a result, the carefully designed metadata structure was often missing vital data. By prompting users consistently for metadata during upload, including multiple file uploads, MacroView DMF eliminated this failure to capture metadata. MacroView also extended MacroView DMF to support a number of custom metadata columns. One of these was a Person-Group column that was customized so that the current user was displayed as the default value. This small customization eliminated several user input actions as most documents were being saved. The biggest reduction in user effort when saving documents resulted from another customization of the MacroView DMF metadata capture form. 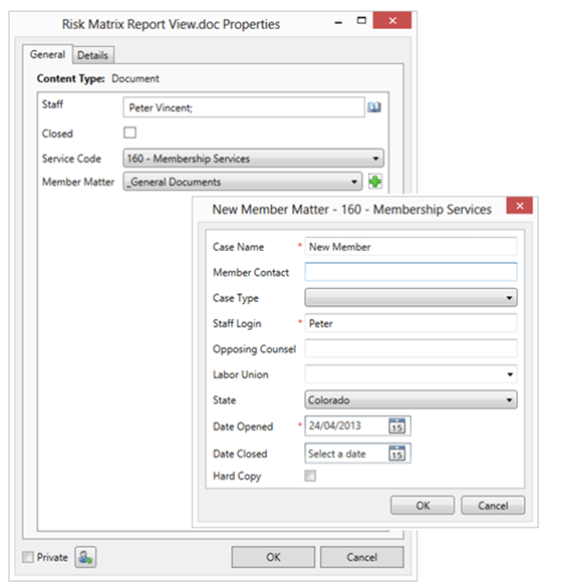 MSEC commissioned MacroView to add a New button to the form, which users could click when they realized that the Member Matter they wanted to choose was not yet created in the CRM system. A sub-form captured details for a new Member Matter and created it in the CRM system. Previously the user had to abandon the save, go to the CRM system and create the new record, return to MacroView DMF to resume the save and then find the record that they had just added. The customized metadata capture form allowed users to create a CRM record as they saved the first document for a new Member Matter. The customized MacroView metadata capture form reduced user input actions by over 60% and led directly to increased user satisfaction with and adoption of SharePoint as the solution for managing documents and emails. Customized MacroView DMF profiling dialog being used to create a new record in the CRM system.